The organic foods grocer is slowly but steadily building out an affinity program that will drive traffic and incremental customer purchases. Screen shot from a video describing features of the company's mobile app. Image source: Whole Foods Market. Of the various business narratives Whole Foods Market's (NASDAQ:WFM) management spun out during the company's fiscal Q1 2016 earnings conference call last week, the grocer's mobile marketing efforts were a prominent and recurring motif. Whole Foods launched digital coupons through its mobile app nationwide this month, and it plans to introduce a digital version of its paper sales flier later this year. Shareholders may recall that the company has been prototyping an affinity, or rewards, program for some time -- the first test market activity began nearly two and a half years ago, in the fall of 2013. This program is meant to evolve into an overarching platform powering the company's mobile app. On the earnings call, Co-CEO Walter Robb didn't provide a timeline for release, but he did confirm that the test program would expand to a new market in Q3 2016. 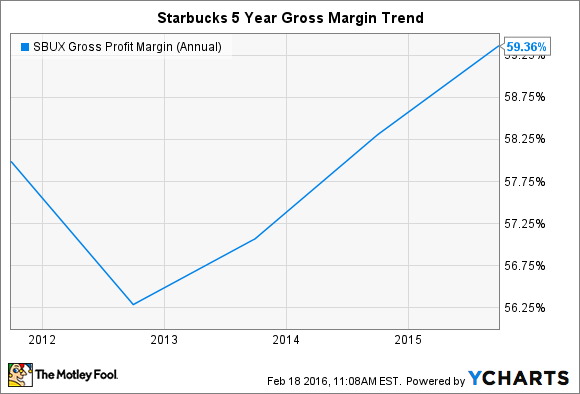 Given the speed at which transaction innovators in the consumer goods industry, most prominently gold standard bearer Starbucks (NASDAQ:SBUX), are able to evolve their digital tools, this long wave of testing has the feel of extremely tentative progress. So, there's wisdom in management's decision to release elements of its mobile platform, such as the digital coupons, along the way. Robb noted on the call that this next phase of testing combines "the best elements" of the initial phase, but at a lower cost to the company, indicating that management is more concerned with getting the platform right, than rushing it out to market. The investment in a digital affinity program may be taking time, but on the positive side, work to date is yielding management new insights into Whole Foods' business. Robb shared that the company has gathered a trove of information that sorts patrons into five distinct customer segments. The segments have been tokenized, meaning the company is tracking mobile users' shopping habits and preferences within these as-yet undisclosed categories, and analyzing the data. Beginning to glimpse customer types and purchase behavior trends, both of which can be opaque when a company is simply ringing up SKUs on a register, is a prerequisite to targeting shoppers with specific, personalized offers. And ultimately, pitching unique offers to enrolled customers is the type of activity Whole Foods' platform should enable in the future. It's a bitter and expensive truth in the retail industry, but an affinity program that lacks action on accumulated data is, after a period of time, simply a glorified sales flyer. In addition to serving as a portal to value offerings and a communication channel, a well-designed affinity program will also incentivize customers to shop with increasing frequency. During the past quarter, Whole Foods successfully tested its ability to "digitally activate customers" through a mobile outreach touting limited-time offerings like $0.25 cups of coffee. This type of "activation" is an appropriate place to make investments in gross margin -- that is, to give up a small bit of profit now for future gains. So far, the company has indicated that gross margin will decline more in quarters two through four in fiscal 2016 than the 86 basis point (0.86%) deterioration seen in the first quarter, as Whole Foods ramps up discount offerings to protect its turf from encroaching peers. As you may note, going a bit over 86 basis points doesn't equate to a huge amount of margin compression. This is in keeping with the expressed philosophy of company executives over the last few years, that the grocer won't engage in a pricing "race to the bottom" with competitors. Some of Whole Food's margin compression is being offset by staff reductions and an automated labor scheduling process instituted late last year. But if doubling down on higher-profit businesses like prepared foods is a 2016 priority, as management has stressed, it makes sense to pull loyal customers repeatedly into stores, and frankly, this is worth the investment of even 100 to 150 basis points of gross margin in the near term. Starbucks' experience with developing a truly robust digital affinity program illustrates this point. Kevin Johnson, Starbuck's Chief Operating Officer, recently pointed out that the coffee retailer's mobile app, which is associated with 22% of all U.S. transactions, is driving significant "incrementality." In other words, the "My Starbucks" program is causing customers to visit more often, and tack on additional items to their orders. Incremental sales are a fine way to boost margins, if you can capture those extra patron visits. The lesson of the above chart is that margin dollars given up to incentives that attract customers into your retail space can get replenished, and then some, given the right execution. If Whole Foods can gain even half of the basis points in margin that Starbucks has added to its P&L, it will be worth both the initial investment, and the long wait, for the complete launch of its affinity program.